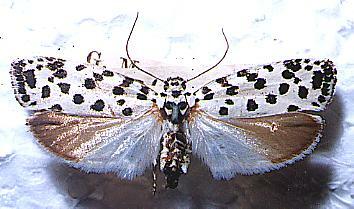 The adult moths of this species have white wings, with a pattern of black dots on the forewings, and an area of grey on the hindwings. 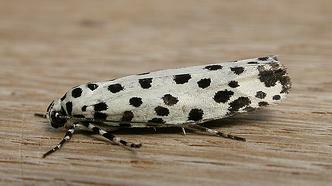 They have a wingspan of about 3 cms. Melbourne University Press, 1990, Pl. 24.7, Fig. 24.15, p. 248. Supplementary Series 33, 1985, Volume 112, pp. 1-58. Volume 29 (1917), pp. 89-90. CSIRO Publishing, 2007, p. 82.